Of all the ideas, the Estates are likely to be abandoned, partly because it is difficult to scale a 4-estate-system to 3 and 5 players and partly because it would restrict the players' strategies too much. The idea is to allow a player to take on for example a peaceful trader strategy in opposition to another player who goes for an aggressive military strategy. 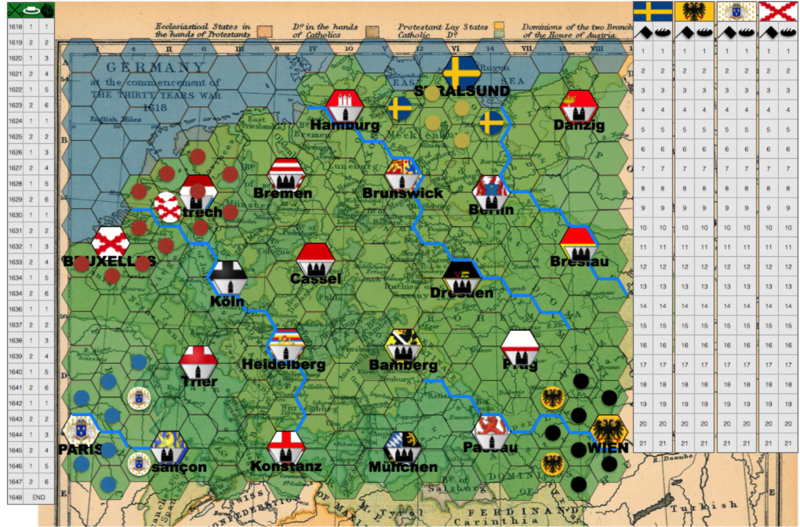 The game idea in short: The players play noble factions during Sweden's major power era. Together, they produce goods and build ships to conduct trades or conquests overseas while at the same time fight Russia, Poland-Lithuania and Denmark. As with all the games in the Nova Suecia series, it will be a no-luck balance between cooperation and competition. You may follow the development at the homepage. 29 April 2014: Tre Kronor Infernum is now published at boardgamegeek.com. 28 April 2014: 5 player game test completed. I finally decided to remove the servant bonus role, since I felt that this would affect the balance between saving a room and letting it burn down. With this decision, the test game became an interesting affair where players hesitated to place the last connecting servant since this would give only the other players the opportunity to act in the room. Red, blue and green managed to connect to most rooms and primarily stole from them while blue and yellow focused on extinguishing fires. The result was that several rooms burnt down but none with saved or stolen possessions, and in the end blue emerged as the winner thanks to few connected rooms but well placed save markers. The diagram below marks fires with F, ash with A, save markers with + and steal markers with -. The table below shows rescued rooms in bold and burnt down rooms in italics. With this, the game test of Tre Kronor Infernum is completed and ready for publication! 27 April 2014: Will there be a sixth game in the Nova Suecia Series? I am playing with the idea of connecting the economic theme of Nova Suecia, the military theme of Bellum se ipsum alet, the faction struggles of Christina Regina, the building of Vasa Regalis and the connection elements of Tre Kronor Infernum. Is it possible to make such a game interesting and yet keep it simple? There is only one way to find out! I will start by studying the historical background and see if the game ideas come naturally. The theme? The working name is a hint - Mare Balticum. 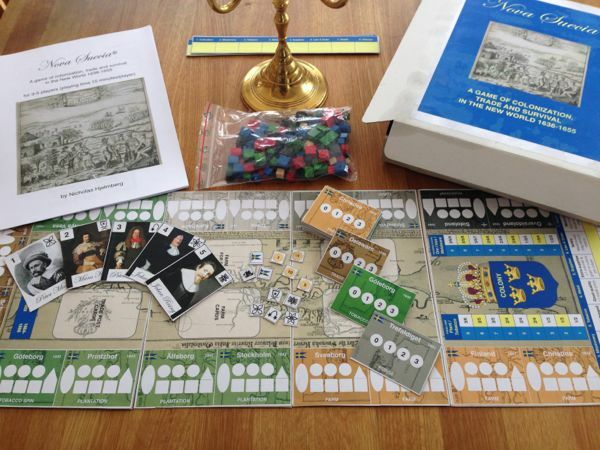 26 April 2014: Draft components for Tre Kronor Infernum completed. The game board resembles that of Christina Regina, using wood as background rather than stone (after all, the castle is burning), while the marker symbols more remind of Vasa Regalis. I am also careful to use the same color codes throughout the Nova Suecia Series. The red color for example is used for the red player in Christina Regina as well as the sculptures in Vasa Regalis. It is also the theme color of Christina Regina, used for the cover and the home page. Some more game tests remain and then Tre Kronor Infernum is ready for publication! 25 April 2014: 3 player game test completed. Initially, the game was less chaotic than the 4 player game, since 2 players could play for the same strategy in a room, making it difficult for the lone 3rd player to interfere. However, the tension increased as the fewer players offered more tactical opportunities and at one occasion, the fire spread outside a room, threatening the entire castle. In the end, yellow was the winner thanks to presence in most rooms (although blue and red actually extinguished more fires). The advanced servant bonus rules would not have changed the outcome as yellow would have received 2 additional points. 24 April 2014: Second game test completed and I feel that Tre Kronor Infernum has now entered a mature stage. The fire spread rules got one more adjustment to make them even more unpredictable. Previously, the fire spread only every 4th turn, something that made them not only predictable but also in the same turn in relation to the players in the 4 player game. In the new rule, the fire spreads when more than 1 letter or number has been chosen. The result was a rather chaotic with three distinct stages. First the players placed their servants in the first chain towards the wind. Then they struggled to place servants in position for saving or stealing possessions. Finally they extinguished the fires according to their strategies. The winning strategy for red was most extinguished fires and a good balance between saving and stealing. It was a close run, though. Green placed all save/steal markers correctly and only lost the tie due to less extinguished fires. Blue had the most servants connected to rescued rooms) and would have won if the advanced rule of servant bonus hade been used. 23 April 2014: Draft rules updated with yesterday's new fire spread rule and initial test is promising. Hopefully it will be completed by tomorrow. 22 April 2014: First game test completed and I learnt that I had to adjust the fire spread rules. Previously, a fire spread both through existing fires and through the player's hidden decisions. Theoretically, the rules made sense but practically, they caused two problems. Firstly, they were just not simple. Secondly, they removed the randomness from the players' hidden decisions. The idea is that players secretly choose which coordinates that will be spared new fires. However, with the old rule, they always chose to save rooms not already on fire. The new rule only spreads fires through the more exciting hidden decisions - and is simpler! 21 April 2014: Draft game rules completed! As with the most recent games, they basically wrote themselves once the game idea was clear - I only had to follow the rule to choose the simplest option when in doubt. Next step is to test and tune the game mechanisms and prepare the game components. 20 April 2014: Tre Kronor Infernum is gradually evolving into something interesting. The general idea is that the players score common points by connecting pieces and extinguishing fires. However, player may also gamble for extra points by saving possessions (but will lose points if the room burns down) or by stealing possessions (but will lose points if the room does NOT burn down). As in my previous games, the players have to balance advantages and disadvantages and keep their strategies hidden from the other players. I decided quite early to have a symmetric game board. (After all, the Christina Regina version of the castle was also symmetric.) The first version had nine rooms but felt a bit small. First I thought of adding rooms but more rooms would just make the game longer and more repetitive. Instead, I added an outer corridor (the courtyard) where the players would have to start from well in the corners rather than entrances in the middle. This also fit well with another idea, that the fire may spread. The inner corridor is short but prone to spreading fire and the outer corridor is long but safe from the fire. Again, the players have to balance advantages and disadvantages. 19 April 2014: The new game was named Tre Kronor Infernum and a draft homepage set up with orange as the theme color (to match the fire). I also returned to Nova Suecia to further simplify the fortress rule. Initially, the players secretly distributed taxes to areas but that turned out to be unpractical. Then the players placed 1 tax token each in reversed turn order but if several players had a lot of tokens to place, it would take too long. I finally came up with the simple idea that the players place all tax tokens at once in reversed turn order. The idea wasn't new but before I was worried that each player could build on the previous fortress to deny that player a fortress. The solution was even simpler, don't allow more than 10 tax tokens (the threshold to build a fortress) in each tax area. Sometimes, ideas are rejected too quickly. 18 April 2014: Will there be a fifth game in the Nova Suecia series after all? For a while I have thought of a suitable theme from the same historical era as the four first games and the dramatic castle fire of 1697 has often popped up. However, it was not until now (in spite, or perhaps thanks to, the fact that I'm on vacation) that the pieces fell together. The game combines the mechanisms from Christina Regina and Vasa Regalis. The players must cooperate to save the castle (using tile-laying like in the former) but may also hide treasures for themselves (using hidden cards like in the latter). Stay tuned for more information! 17 April 2014: Of course I couldn't resist a final revisit to my games. Christina Regina was updated with an advanced rule, allowing a fifth faction into play (and a fifth player). I still believe that the four faction version is better since the players have to create scenarios where the Queen is forced to move to their colors rather than moving the Queen themselves with the hope that the fifth color will make it more difficult to guess their colors. Nevertheless, there are now two alternative ways to play the game and I also found a way to introduce two women to the game: Christina's mother Maria Eleonora and her best friend Ebba Sparre. Once again, thank you for following the Nova Suecia Series. This blog will not be updated daily but I will return every once in a while when and if the games develop. Where to go from here? I have tried crowdfunding at FundedByMe with little result. I have considered funding it myself but producers like Cartamundi require volumes of at least 2 000 copies(!). My last option was to submit them to Mayfairgames, starting with the two simplest (Christina Regina and Vasa Regalis). However, I assume they receive loads of games and in any case they have an answering time of 3-9 months. Meanwhile, I'm happy to offer the games for download on the homepage. I hope that you like them and one day will see any of them printed. Thank you very much for following the Nova Suecia Series! 14 April 2014: Test of 3 player Vasa Regalis completed and this time, the Vasa ship sailed! This game was more careful than the 4 player game with the player being careful not to place too low values on the ship. At one occasion, player 2 was forced to play a cloth of value 1 but used the admiral role to replace it with value 2, a clever move that saved not only the ship but also the victory. In the last game turn, all players tried to exchange as many goods at hand into higher values as possible, but player 1 and 3 had to place their wood of value 3 on the ship, leaving only 1 good of value 3 left. Instead, the game was determined by the number of goods of value 2 and here player 2 had 2 goods and the others 1 each. 13 April 2014: Second test of 4 player Vasa Regalis completed and I'm happy to report of a tense and exciting game. I had to adjust a few more things on the way, such as forcing the players to place goods of the same type in the building and giving all players the opportunity to disclose placed goods rather than having to spend a role for it. In line with yesterdays' polishing, I also moved the players' exchange of goods to the advanced rules as they are not really necessary for the game. Now I feel that the game idea works and will only have to test the 3 and 5 player game as well. But what about the tested 4 player game then? The wooden cubes used in Nova Suecia for fortresses were replaced with markers more similar to the flag markers. Following the same rule, the vote in Christina Regina was moved to the advanced rules. In addition, I completed the game components for Vasa Regalis. I used a combination of colors and symbols like in Regina and also made use of symbols instead of text to make the game language independent. In fact, of my four games, only Nova Suecia has game text and only to describe the tax areas. Language independency is not only about the language, it's also a sign of simple rules. 11 April 2014: First test of 4 player Vasa Regalis completed and I can only admit that I hadn't quite learnt my lesson from my previous games. The simple idea of opposite victory conditions does not need complicated production mechanisms. On the contrary, the simpler the first part of the game is, the more focus there will be on guessing what each player has on hand and how he or she uses it. Get good and use it - that is all what is needed. Away went the idea of trade to generate gold to pay for goods and left was a much cleaner game. Both the updated rules and more information on the game is now available on the homepage. In the weekend I look forward to the second test and the design of game components. 10 April 2014: Detailing the rules of Vasa Regalis, I weighed back and forth in the decision on which economic game mechanism to use for the acquisition of parts to the ship. Should the players have symmetric or asymmetric access to building parts? Should they have different goods facilities like in Nova Suecia or should it be role-based like in Puerto Rico? How many stages should the goods pass through from raw material to building part? Should gold be included or not? Asymmetric access was an easy decision as this is important to enable the players to guess each others' hands (and thus the placement of building parts on the ship). More difficult was the decision to go for roles. To make roles interesting, the different roles must give the players different options to expand their economy, otherwise one role will give all players basically the same result. But I wanted to have few and simple options! After having considered options of goods contracts, workshops, workers and so on I finally settled for the simple value chain procure-craft-trade (to get money) OR build (to get victory). I first considered adding gold or similar benefits to the player choosing the role but feared that this would create an inflation since the game is not really about expanding economy. Instead, I gave the first player double actions and the last player no actions. That should create both tense and resource limitations. The draft rules can be found in the rules section. They are now ready for test. 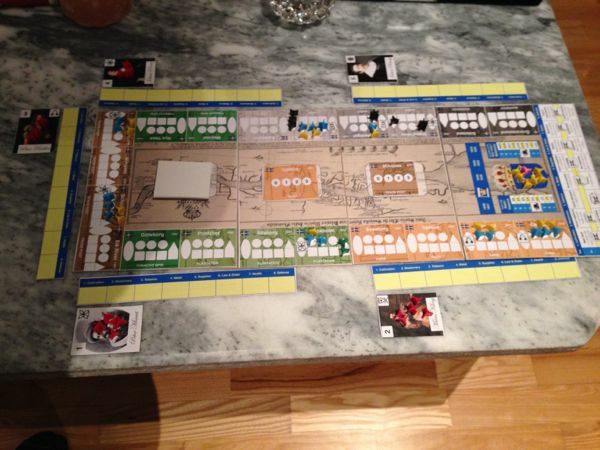 9 April 2014: Draft rules and homepage for the next game Vasa Regalis completed! The basic game idea is that the players will select roles to produce parts to the ships but unlike other games there is an important catch: the player contributing the most will win only if the ship sinks, otherwise the player sneaking away most will win. 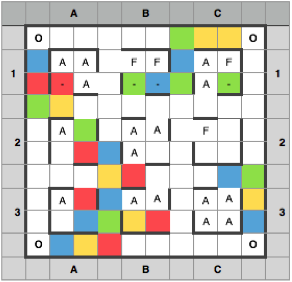 Thus, the players must guess the other players' strategies to win. More information will be presented on the homepage the next few days. 8 April 2014: When is a game completed? Although Christina Regina was considered completed, I couldn't help returning to update some historical details. After having read more about the real Queen Christina, I felt that I had to change some of the historical background, such as letting in Karl Gustav into the faction trying to win her heart. 99% of the players will likely ignore the history behind the faction and refer to them by their colors only but still, I want the theme to fit as well. Another change was the addition of symbols to the colors (scroll for art, shield for politics, heart for love and cross for religion), partly because the simple colored tiles felt a bit boring and partly to give the colors more meaning. But as I said, I still think players will see only the colors. Last but certainly not least, a new game idea was born on my way to work and before I arrived, it was more or less complete in my head. It will be called Vasa Regalis and more about that shortly. 7 April 2014: The retest of the smaller Bellum se ipsum alet is completed and I'm very pleased with the result. Initially France and Spain fought each others to a standstill in the center while Sweden expanded in the East and Austria in the South. Both Sweden and Austria balanced on the victory threshold, the former with 4 captured cities (Berlin, Danzig, Copenhagen and Breslau) and the latter with 32 influence tiles placed. The Count of Tilly made a spectacular attack against Northern Germany, threatening both Berlin and Copenhagen, until driven away by Gustavus II Adolphus. When the French recovered and advanced into Saxony, Austria's victory chances diminished. Meanwhile, Johan Banér had sneaked south and managed to capture Prague. The Spaniards launched an attack on Copenhagen but with the last of his resources, Gustavus II Adolphus drove them away and claimed the Swedish victory with 8 points (2 leaders, 1 headquarter and 5 cities). It was a close call - 1 more game turn and a revolt in Danzig would have turned the city into a ruin, bringing the Swedish victory chances with it. The game statistics shows that the game is exactly like I want it: An intense struggle where players rise and fall as they try to wage battles in the right time and the right place to reach above the victory threshold. 6 April 2014: After six weeks of intensive game development and test, I can look back on the results: Nova Suecia, Bellum se ipsum alet and Christina Regina. Interestingly, but perhaps not surprisingly, the time spent has decreased for every new game. Nova Suecia took 4 weeks and 2 reworks to finish (partly in parallell with the other two), Bellum se ipsum alet 2 weeks and 1 rework and Christina Regina only 1 week with no reworks. The comparison is a bit unfair since the Nova Suecia is the most complex of the games and Christina Regina the least. Nevertheless, it looks like I have learnt a lot about game design on the way. 5 April 2014: The Bellum se ipsum alet make-over continued with the map. The previous 18 cities and 30 game turns gave the players plenty of space and time for careful movements. This may be a good for a long strategical game but I wanted a fast tactical game. 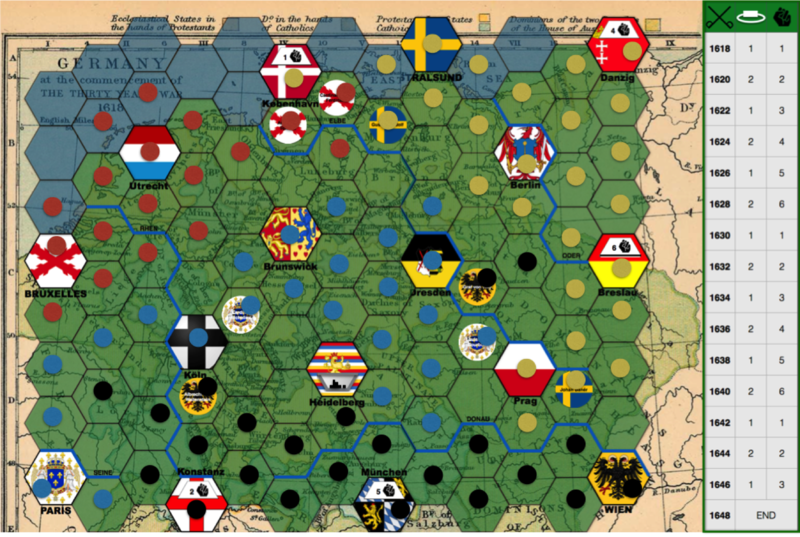 The map was shrinked, the cities reduced to only 12 and the game turns to 15. I look forward to an intense game at next test. 3 April 2014: The testing continued with Christina Regina being tested with 3 and 2 players. The 3 player test became a passive game where no player wanted to step on a colored influence tile until "seemingly" forced to in order not to reveal the color. The game seemed to go in blue's favor but the last move convinced red and the stab fell. That gave the victory to green who, without stepping on any colored influence tile, scored 9 points. Red was second with 6+2 points and blue third with 9-2 points. The non-playing black color scored 6 points but I'm not yet sure whether to allow non-playing colors to win as an interesting twitch. The 2 player test became a strange game where blue lured red into a trap and forced a disclosure of the color. 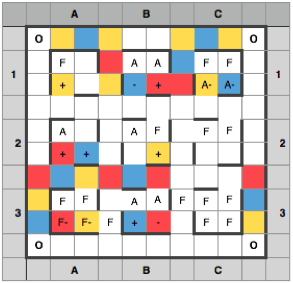 However, the result of the early assassination was that while blue had to continue playing carefully, red could play more freely and go for the high-scoring influence tiles. Red never managed to disclose blue's color but won anyway with 8-2 points against 5 points. 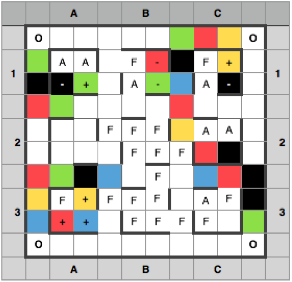 Note that the non-playing colors green and black scored 9 and 10 points respectively, that is more than both blue and red. The conclusion is that the 2 player game gets more tactical with interesting opportunities to put the opponent in "zugzwang" (forced move). I also "failed" the usability test by misreading the score table. 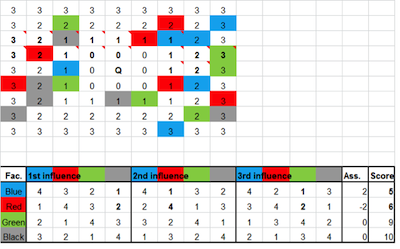 For some reasons, I had initially used colored circles to indicate influence tiles and colored squares to indicate factions in the table. 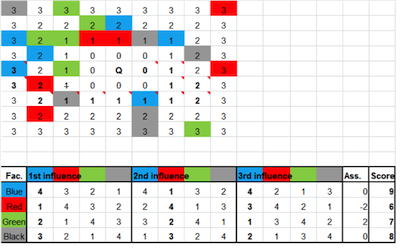 However, in the game the influence tiles are squares and the color markers on the faction cards are circles! Obviously, the two should be consistent and the table had to be updated. 2 April 2014: First game test of Regina completed and I was happy to see that the game idea worked as expected. The only addition to the rules was the concept of colored daggers to keep the colors of the players engaged in an assassination secret to the other players. The game started cautiously with the players unwilling to reveal their agendas. Blue and black managed to steer the Queen towards their influencers and red and green fell behind. The end game got tense where green, being last, took a risk and succeeded in assassinating blue. This paved the way for black who, through an assassination on red, looked like the winner. But black's action revealed his own color and enabled blue to bounce back by assassinating black. The final score: Blue 9+0, Black 8+0, Green 5+2 and Red 8-2. The image shows the test and result (executed in Excel with bold figures showing the Queen's movements). Black 8+0, Green 5+2 and Red 8-2. In addition, since the rules are so simple, I tested them on my (non-playing) wife. Unlike the rules of Nova Suecia (which she thought were complicated) and Bellum se ipsum alet (which I did not even dare to test on her), she both understood the rules and thought they made sense). It looks like my third game will be ready for publication before my second! 1 April 2014: All three games in the Nova Suecia series now run in parallell - my ability to manage several things at the same time certainly comes handy! 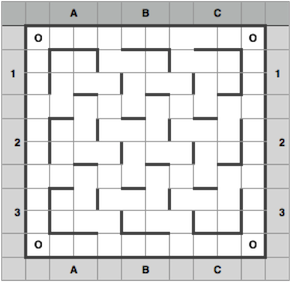 The Christina Regina rules were updated with a simple but brilliant idea: the blank influence tile, allowing the queen piece to move through the castle in a "snake-like" pattern before encountering influence. (Everybody who has owned a Nokia mobile from previous decade will know what I mean.) The Bellum se ipsum alet test proceeded without rule changes, indicating that they may have reached a mature stage already. However, the test is a bit slower since I cannot simulate the game in Excel but have to move the pieces on a map (although electronic). For Nova Suecia, finally, I started to investigate options for marketing and producing. The former costs $500 at boardgamegeek.com while the latter is likely to cost at least 20 times as much. Considering that my crowdfunding effort has only raised €25 after the first week, there is still a long way to go. On the other hand, my homepage has soon reached 100 visitors and twice as many have visited the game at boardgamegeek.com so with some luck, the interest will result in concrete support. Meanwhile, I have started to look into ways to reduce the need of printed materials for Nova Suecia (such as replacing the player aides with a page in the rules to photocopy) and expect to publish the other two games soon to help spreading the awareness of the Nova Suecia series. 31 March 2014: Boardgamegeek.com was updated with a review of Nova Suecia named Nova Suecia - an intricate web of dependencies. Read and find out if it is something for you. 30 March 2014: Another break from Nova Suecia to complete the first draft rule for Christina Regina. It is a much simpler game than both Nova Suecia and Bellum se ipsum alet but has a very interesting guessing mechanism that I look forward to test. 28 March 2014: Sometimes exciting ideas have to capitulate to practicalities. The idea of the players secretly chosing tax areas has been with the game since the beginning but it is difficult to realize. The first player mats were too difficult to hide from the opponents. A "Treasury", a small coffin with different sections for different tax areas where the players place differently colored tax tokens, could have been a unique game feature, like the Castillo in El Grande, but very cumbersome to administer. Pen and paper, like in Diplomacy, would have been simpler but still not very efficient. I finally gave in and let only the total tax amount be paid secretly. 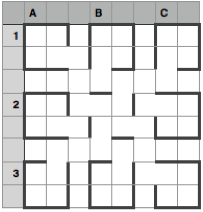 The allocation is then done in turn order sequences. Much simpler and more elegant, without losing too much of this important nerve in the game (or perhaps even adding nerve as the other players' taxes gradually are revealed). Another simplification was to let fur traded from trade posts go directly to the players rather than residing in Colony first. Simple lean management - remove all unnecessary steps in the flow. I also said good bye to the tax area Health (since I already had Supplies to affect colonists) in favor of English relations (affecting the taxation itself). Now all parts of the game have one and only one tax area. Again, much simpler and more elegant. Last but not least I was happy to see that my project at FundedByMe has received its first funder! 27 March 2014: Boardgamegeek.com was updated with a colonist's account of Nova Suecia. Read what it might have been like to work under governor Johan Printz! Last but not least: Nova Suecia is now open for crowdfunding at FundedByMe! 25 March 2014: Second live player test completed and with some very interesting results. Some of the new rules (particularly the additional production options for farms and trades) were considered to offer too many options. Basically, the players found it difficult to predict the outcome of their actions. I still think the idea of lumber as a scarce resource is interesting but it seems like it simply adds more complexity than game value and have to be moved to the advanced rules. Another interesting observation was that many of the ideas brought up were things that actually were part of the previous test version, such as colonists rather than gold being used for building log cabins. This may partly be explained by the fact that some testers saw the game for the first time. I still believe in the balance game idea but need to think about what to keep and what to remove to make the component handling smooth and the playing experience pleasant. 24 March 2014: The internal retest is completed and I am glad to see that the new balance works fine. The new concept of log cabins does increase the productivity but not too much and the struggle to be the first to build a fortress does add a nerve to the game. Who won then? In a tight game, Peter Minuit, Måns Kling and Peter Ridder all built two fortresses each and after counting the gold, Peter Minuit was declared winner with 52 gold before Måns Kling with 49 gold and Peter Ridder with 40 gold. Peter Ridder's farming strategy gave him a lot of gold initially and enabled him to build the first fortress but the tobacco and metal producers caught up and Peter Minuit's control of the tobacco business made the difference. In addition, I am proud to present Nova Suecia at Boardgamegeek.com. 22 March 2014: Rule and game components updated, again and hopefully the last time before tomorrow's internal test and next week's live player test. I now feel that all district types have interesting game options and look forward to see them applied for real. I also spent some time reviewing and publishing the first draft rules and game components for Bellum se ipsum alet, although the test is still far away as Nova Suecia requires all my attention. 21 March 2014: I have noticed a common pattern after brainstorming and updating sessions. First I think that I'm ready, then the ideas keep coming and start elaborating on more and more intriguing additions to the game and finally I start to shoot down my ideas one by one with arguments like "they are too complex" and/or they don't add gaming value. In the end I was more or less back where I started two days ago, hopefully a sign that the latest updates are mature - not too little and not too much. The only addition that passed the test was another idea to entangle the district types: adjustments of the prosperities and disasters so that more than one type is affected. Now it's even more difficult for players to avoid being affected by problems in the colony and the challenge to play both for the colony and oneself is even greater! 20 March 2014: Rule and game components updated. The adjustments actually added more simplifications than complexities and the rules got slightly shorter - a good sign! Now it remains to see if the updated game stands the test. 19 March 2014: After some brainstorming, I came up with several adjustments for adding more nerve into the game without taking away the general idea of cooperating for the colony's best. Previously, all district types were restricted to the their particular production but now they may engage more with each others. (Farms may trade lumber for log cabins, trade posts may trade grain and overseas, and tobacco and metal trade generate tax as well.) In addition, districts are now randomly drawn and colonists may be placed without restrictions. Finally, and perhaps most interesting, gold may be used to build forts that give more protections against disasters and add victory points in the end. As the forts are limited, the players must choose how to invest their money. Thus, no major changes but I need to update rules and components as well as my previous test runs to assess the outcome. 18 March 2014: The first live player testing is completed and I learnt many interesting things. The game sufferd from an early disaster which reduced the number of colonists and the players did not manage to (or rather did not have the incentive to) restore the colony balance. The feedback included too few choices in some cases, too few possibilities to disrupt other players' game and no financial pressure as gold accumulates towards the end. The general impression was that I should loosen the tight balancing mechanisms and introduce a little more chaos. Back to the work desk! 17 March 2014: The Bellum se ipsum alet was updated with background information on the game, the rules and the theme. I hope you find the game interesting. 16 March 2014: The first rules draft for Bellum se ipsum alet was completed and I set up another web page to document the development. You can find it at http://www.novasuecia.se/bellum/home.html. 15 March 2014: Today was the first day since I started the Nova Suecia project that I actually let the board game rest. There is simply not much left to do until the live player test. Instead, I started to compile my ideas for my next board game: Bellum se ipsum alet (the war nourishes itself). The theme is the thirty years' war, which fits well with Nova Suecia's theme, and the game mechanism is an interesting link between supplies (from captured cities) and army strength. However, unlike the never ending supply in games like RISK, the cities will in time revolt and deteriorate until all Europe is devastated. Thus, both Nova Suecia and Bellum se ipsum alet make us of the historical doomsday scenario. 14 March 2014: The invitations for live player tests have been sent out to friends and colleagues. The next few weeks will determine the future of Nova Suecia - The Board Game. 13 March 2014: With the usability test completed, I decided to try crowd funding and submitted an application at FundedByMe. I'll still wait for the live player tests before making a decision whether to produce the game or not but it doesn't hurt to look for funding opportunities already now. 12 March 2014: After a lot of cutting and pasting, I finally had a reasonably good prototype for the the first usability test session. (Instead of wooden tokens I used playing pieces from RISK but they worked fine.) As the picture shows, there is a lot of activity going on in the districts but it is easy to tell the tokens apart by their color colors (blue for colonists, yellow for food, green for tobacco and black for metal). I learnt several interesting things from the usability test. I feared that some token transactions, such as moving foods to colonists or goods from raw state to manufactured state, would be chaotic but they were all controlled by the turn order and the designated game board circles and squares. However, I had overlooked some simple things such as allowing space for the cards up for bidding. The new game board was thus slightly modified for the next usability test session. 11 March 2014: The full 5 player game test is completed and I congratulate Måns Kling to a tight victory. Again, he got the upper hand in the metal speculation and beat the other metal governor Johan Printz with 46 gold against 43. Johan Rising and Peter Minuit fought a similar battle in the tobacco business where the former gained 45 against 42 gold. Peter Ridder's farm strategy was only enough for a shared 2nd place with 45 gold. The 3, 4 and 5 player game tests have proved that Nova Suecia is well balanced and that the players need to take advantage of the bidding, the trade negotiations and the taxation to get the upper hand. I will now put together the prototype for the usability test and hopefully have a live player test started within a week or two. 10 March 2014: The full 5 player game test has now started. Half-way through, the new governor Johan Rising has gone all in on tobacco while the rest followed their old strategies (Minuit for trade posts, Ridder for farms and Kling for metal). It will be interesting to see how the game dynamics is affected by the fifth player. I also printed out the game components for the next test phase: the usability test. The game may work in my theoretical spreadsheet but how does the physical handling of the game components work? That will be an important test before the live player test. 9 March 2014: The full 3 player game test is completed! In another exciting fight, Måns Kling and Peter Ridder again shared the victory with 45 gold each, just 1 gold ahead of Peter Minuit. They picked similar strategies as in the 4 player game test, Ridder cashing in safe farm gold and Kling risky metal gold. Minuit's trade posts provided him with lots of gold and hadn't he been beaten to the best tobacco trade prices by Kling, he would have claimed the victory. It's clear that if all players use their colonists optimally, they have to outguess each others in the taxation to get the first-mover advantage and thus the better trade prices. 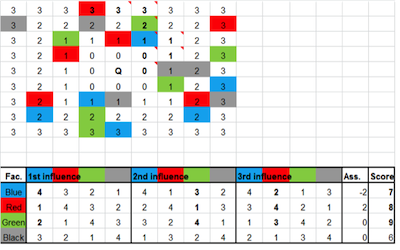 Another observation is that there was less trade between the players and all managed to acquire complete value chains (Minuit got both plantation and tobacco spin, Ridder got both mine and forge and Kling got complete both values chains for both.) My conclusion is that the game is playable with 3 players but more interesting with the increased dynamics in the 4 player game. I now look forwards to the coming 5 player game test. 8 March 2014: A day without rule changes! I hope that's a good sign that the rules have now matured. However, I must admit that I did add two advanced rules; one extension, where districts are gradually removed again from play, and one about corruption, where the player may try to move or steal gold in the taxation phase. I like both but still recommend the basic game as a start. Meanwhile, the full 3 player game test continued. 7 March 2014: The full 4 player game test is completed! In an exciting fight, Måns Kling and Peter Ridder finally shared the victory with 50 gold each, just 1 gold ahead of Peter Minuit and 2 gold ahead of Johan Printz. They all picked different strategies but none of them managed to "break the game". Instead, the balance was kept. Ridder benefitted from his higher taxes, which often gave him an extra worker, while Kling managed to sell at high overseas trade prices. The statistics are not surprising, the risky district types (which may build manufactories and speculate in the market price) generate a higher return per colonist used whereas safe options (farms and trade posts) generate a high total income. It's also clear that the district types early in the value chain (plantations and mines) need to negotiate to get their share of the return. Overall, the game mechanisms and balance now work and I look forward to proceed with the 3 and 5 player tests! 6 March 2014: Game testing does not differ much from the IT testing I'm used to. Last week's "functional testing" proved that the general game mechanisms work and this week I continued with "non-functional testing", involving a lot of tweaking and tuning to get the small details well-balanced. Sometimes I felt lost in all balance calculations and considerations but one thing always helped me choose the right way: The simplest is usually the best! 5 March 2014: Time for the first complete game test! Starting with the 4 player example from the rules, the four governors quickly embarked on different strategies. Peter Ridder went for farming and acquired grain monopoly, which gave him an initial lead and also helped him pay taxes and frequently claim the first order marker. Måns Kling and Johan Printz competed fiercely in the metal business but finally agreed to cooperate, Måns Kling focusing on mines and Johan Printz on workshops. Peter Minuit started with a trade post and then moved in to the vacant tobacco business. Half-way through the game, the other governors have caught up with Peter Ridder and it will likely be a close fight to the end. 4 March 2014: Premiere for novasuecia.se! I hope you will enjoy reading about the game development as much as you will enjoy the game itself! 3 March 2014: Another thing that had nagged me was the challenge of making the game equally balanced for 3, 4 and 5 players. The flexible number of districts to allow 4 districts each was there from the beginning. But how to manage the fact that there are more trade posts and thus more tax when there are more players? Earlier I had an idea of removing tax areas when there are less players but could not bear to choose among them. Finally I added two more, which also made sense historically: internal (dis-)order and supplies from the motherland. Closely connected to this was the finalization (?) of the game's food balance. Trade posts no longer generated food but instead supplies arrived with food every game turn. This also opened up a long wanted tactical opportunity for farms. I now allowed them to store food and thus speculate in food prices rather than just mindlessly deliver each game turn. Now all districts may face the agony of decision! I called it a day by ordering the domain name novasuecia.se for the bargain price of 12 SEK for the first year. 2 March 2014: Finally I had time to sit down and work on this game homepage. I chose a simple and clean design so that I could continue to focus on the game and used the game's fonts and pictures. After all, the homepage is just supposed to present the game and give the background in a clear and concise manner. What do you think? Please feel free to leave a comment in the guestbook next to this. 1 March 2014: One thing that had nagged me was an earlier observation from my play testing. A player owning all parts in a value chain would make the same profit by trading as by doing everything him- or herself. Although this risk minimizing strategy shouldn't be discouraged, trade should still be a viable option. But how? Finally a jogging session helped me clear my mind and find a simple solution: the full province bonus. A player may still go for value chain control but now, the option to specialize in one part of the value chain and trade with a player specializing on another part is a risk that does pay off. A simple solution with a wide impact! Other work included updating the rules with small historical notes, connecting the game to the theme. More about them in Theme. 28 February 2014: The play testing and simulation continued and finally I found the proper role of the trade posts. As they were now, they would either be worse than farms (by getting grain and sell after the farms) or better (by getting gold, which always is more worth than grain). I solved it by finally introducing fur to the game, the most important trade good of Nova Suecia. By simply giving the trade post player fur, of which one part could be turned into gold and another part into tax, farms and trade posts would have different values depending on the player's strategy. Now no game path was automatically better than another, like it always should be in a game! 27 February 2014: After some intensive days of play testing and ideas to rule modifications, I let the game mature for a while. Instead, I returned to the game components. My first map had the district plotted on the map but since the historic districts were not evenly spread along the Delaware river, the map got... well, plotted. Instead I moved the districts to the edge and put in a 17th century map instead. It was also now that the governors got their simple symbols (and poor governor Papegoja replaced by Rising since I did not know how to make a parrot symbol). Of course my brain could not completely take a rest from the rules. Some more game break rules were introduced, among them the ability for the leading players to adjust the taxation so that no more than one disaster per game turn strikes the colony. It was also today that I started to think about this game homepage. 26 February 2014: My favorite game designer, Reinier Knizia, once said that a game is not ready when all that can be added has been added, it is ready when all that can be removed has been removed. That's what I started to do now. One example is a small table that showed how much tax a trade post generated, based on number of colonists and number of players. Imagine having to consult a table each and every time! Begone! 25 February 2014: The play testing started and again I relied on a spreadsheet. In the real game, all the balances are maintained through the movement of tokens back and forth but in the test I needed to document and evaluate all this. How many colonists are available this game turn? How much profit does one type of district generate over the entire game compared to another one? What would have happened if a player would have taken a slightly different action at an earlier game turn? Again, I had many questions that needed answers. 24 February 2014: The rules were now completed with details on every district and product type. During this process, I felt that farms were a bit dull and did not really contribute to the game balance. Again, the theme gave me the idea. Food was often scarce in Nova Suecia so I simply connected the food production with the number of colonists that the colony could supply. No food, no production, no Nova Suecia. Perfect! I now honestly thought that only the play testing remained. 23 February 2014: With the idea clear in my mind, and the mechanisms documented, I started with the fun part: creating rules and game components. The rules were organized around the phases - bidding, production & trade and taxation - and the creation of them helped to critically review them. Was it difficult to clarify a rule? Then it was probably too complicated. I also added concrete examples from the first game turn both to help readers new to the game and to serve as a starting point for my future game testing. For the game components, I used old portraits of the historical governors and a historical map for the game board and the player cards. Although none of them are really necessary for the game, they certainly added a visual appeal. Also, lumber-wood was replaced by the historically more accurate plant-tobacco. The game theme also inspired me to the trade posts as an alternative mean to raise money for players without having to invest in hiring colonists. Actually, they would even benefit if normal trading failed as an interesting counter-weight. However, as many other ideas, the trade posts were only born and would grow and develop further. Is this how artists feel sometimes? I woke up with the idea of this game bursting to get out of my head. Perhaps old memories from simple games created in my youth returned? Perhaps it was the admiration I felt for great Euro game designers like Reiner Knizia? Perhaps it was the discussion with a colleague whether IT test methods could be applied to games as well. Whatever it was, I felt that I just had to create Nova Suecia! I started by noting down the main mechanism of the game: value creation through production, refining and trade where the players would have to cooperate and compete at the same time. But how many steps should I have in the value chain? Initially I thought of two value chains with three steps each but came to the conclusion that three value chains with one (safe), two (medium) and three steps (risky) would create more variation and opportunities for different strategies. Which goods should the players produce then? That was not an important question for the game itself as the mechanism is abstract and can be applied to oil products, bakery ingredients, imaginary fantasy crystals or whatever. However, it was an important question for the theme and as I'm interested in history, I preferred a historical context rather than a modern-world oil business. (Well, I AM interested in bakery as well but humble enough to admit that bakery may not appeal to everybody.) Somehow the idea of colonization came to me and I remembered a book I bought long ago but never read: The New Sweden in America, edited by Rune Ruhnbro. I started to read it and everything fell into place. In the short-lived history of the Swedish colony Nova Suecia, I found everything I needed for a short but intensive game. The acquisition of land, the settlements and improvements, and the internal and external threats. The goods could then be grain, lumber-wood, and ore-iron-metalware. I also got inspiration to two other main mechanisms: bidding amongst the player and secret taxation with impact on all players. I immediately moved my notes to a spreadsheet.